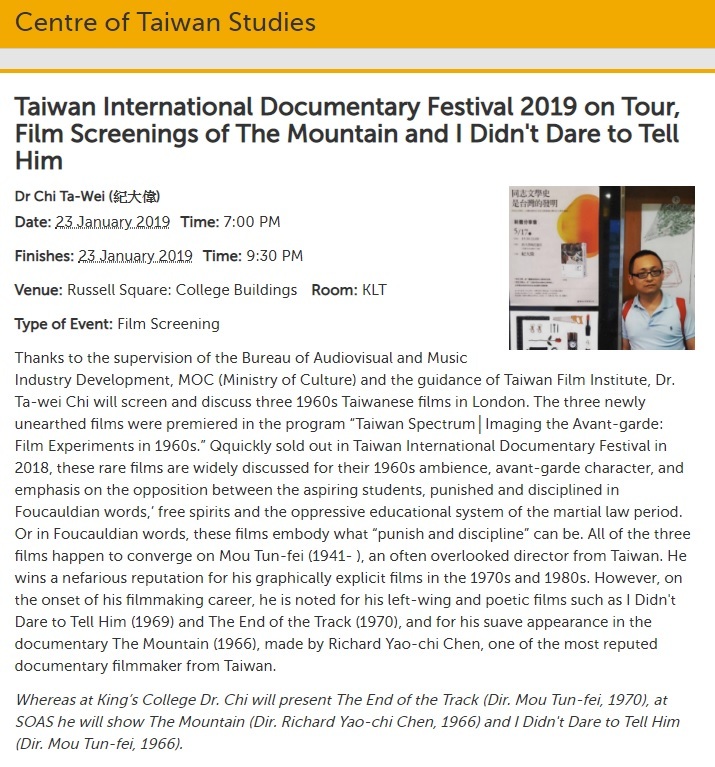 Prominent writer-scholar Dr. Chi Ta-wei (紀大偉) will lead a discussion on three recently restored experimental Taiwanese films from the 1960s at the University of London's Center of Taiwan Studies on Jan. 23, and at King's College London on Jan. 30. 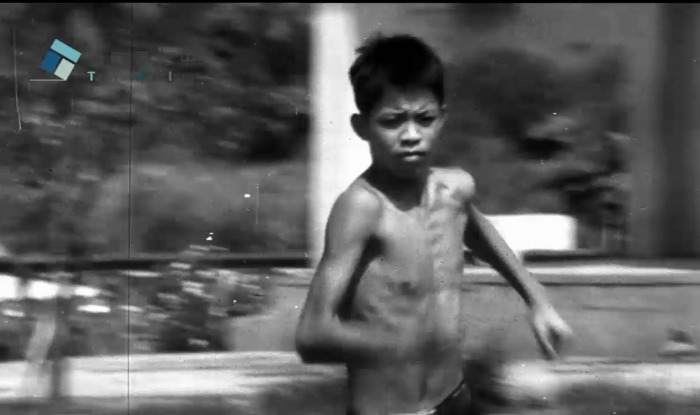 The screenings are part of the Taiwan International Documentary Festival's 2019 overseas tour. All three films happen to converge on Mou Tun-fei (牟敦芾, 1941 - ), an often overlooked director with a "nefarious" reputation for his graphically explicit films in the 1970s and 1980s. 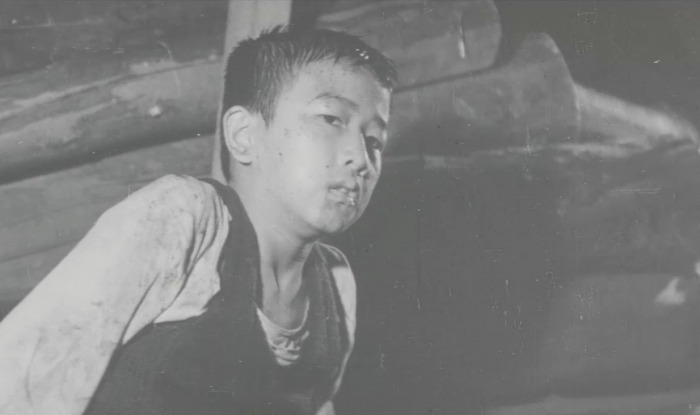 However, on the onset of his filmmaking career, Mou was noted for his left-wing and poetic films such as "I Didn’t Dare to Tell You (不敢跟你講)" and "The End of the Track (跑道終點)," as well as his suave appearance in the Richard Yao-chi Chen (陳耀圻) documentary "The Mountain (上山)." "I Didn’t Dare to Tell You (1969)" follows a student who dozes in class during the day as he secretly works a night job to pay off his father's gambling debts. When the teacher investigates, a series of family disputes ensue. This is Mou's first film after graduating from the National Taiwan Academy of Arts, and it drew much criticism and debate upon its initial release. 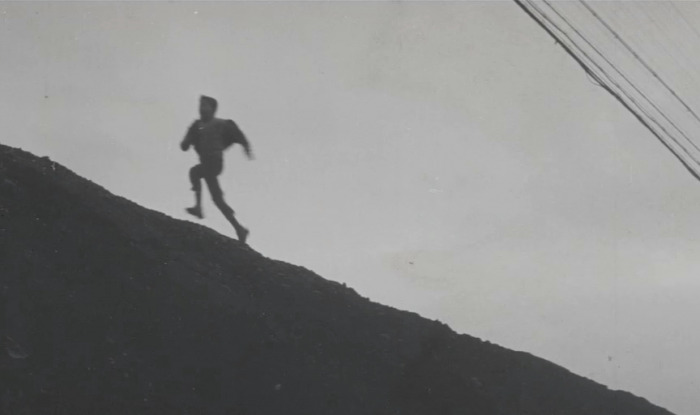 "The End of the Track (1970)" opens with the close friendship of playmates Tong and Yong-sheng, but Tong falls into a dark spiral after Yong-sheng dies in an accident during track-and-field practice. The film was originally banned due to its homosexual overtones and ideology. 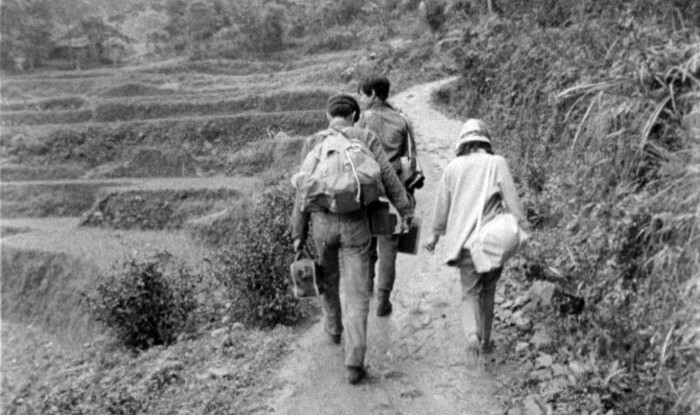 "The Mountain (1966)" depicts Mou and his fellow college students Huang Yong-song (黃永松) and Huang Gui-rong (黃貴蓉) on an excursion to the mountains. As the song "California Dreamin'" plays, the three talk about their artistic ideals, how only Kuomintang party members were eligible for scholarships, and their view on the ongoing Vietnam War. 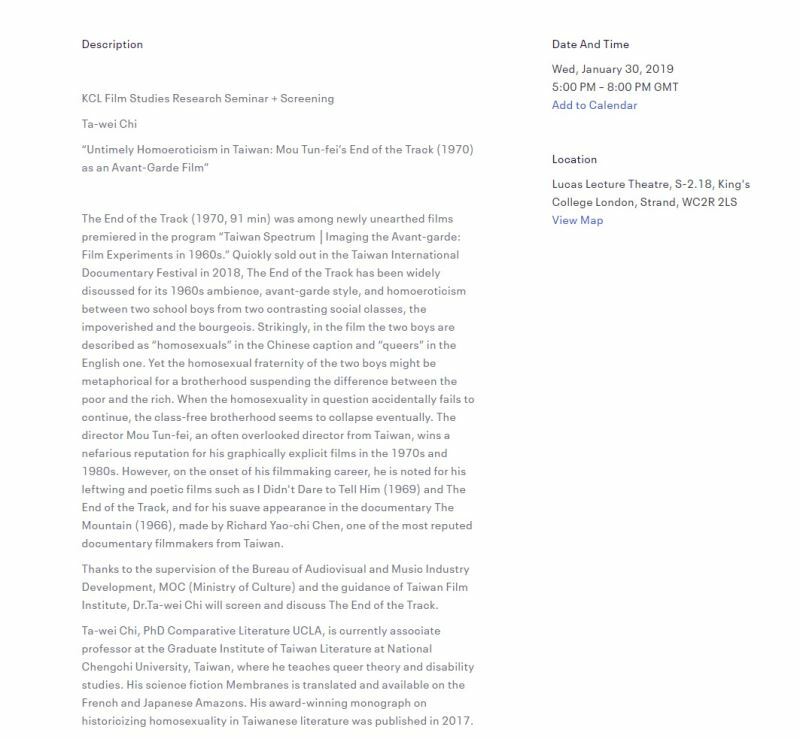 These three films, which illustrate how "punishment and discipline" could take different forms during Taiwan's martial law era from 1949 to 1987, will be discussed in further detail by Dr. Chi at the University of London's Center of Taiwan Studies on Jan. 23, and at King's College London on Jan. 30. Site: "Untimely Homoeroticism in Taiwan"
"I Didn’t Dare to Tell You (1969)"
"The End of the Track (1970)"
Visitors Today:48. All Time Visitors:1,229,855.